We had a great group of folks with us last week. 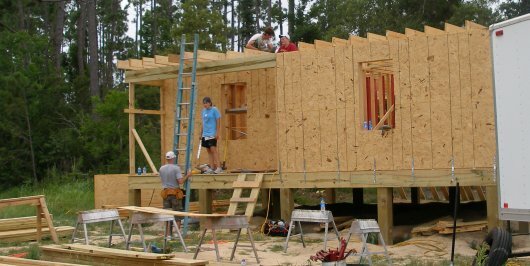 One of the teams, from North Carolina, finished framing up and roofing a new home. The crew, primarily made up of teenagers and headed up by an experienced construction foreman demonstrated another wonderful example of teem work and apprenticeship. They showed how the right team with a leader willing to have patience and direct unskilled volunteers can accomplish a daunting task for the glory of God – and learn marketable skills in the process. What a week we had at Lakeshore.. This has been a life changing week for me, I feel incredible now and so close to God. I wish the best for mrs. Diane and pray she has a good life. This experience and opportunity that GOD has given us to come together with these youth has allowed us to open our hearts and minds and learn from them the ability to genuinely care and be concerned about another human being that stands beside us. I praise and lift up GOD’s kingdom for placing this in front of us as an opportunity to glorify HIS kingdom.